Phil Connors (Bill Murray): Excuse me, where is everybody going? Fan on Street: To Gobbler’s Knob. It’s Groundhog Day! Groundhog Day is a popular annual tradition celebrated in Punxsutawney, western Pennsylvania. Groundhogs hibernate each winter. The superstition is that if the groundhog (Punxsutawney Phil) emerges from his burrow on February 2nd and sees a shadow due to clear weather, he will retreat into his den and winter will persist for six more weeks; and if he does not see his shadow because of cloudiness, spring will arrive early. TV weather presenter Phil Connors, news producer Rita Hanson (Andie MacDowell) and camera operator Larry (Chris Elliott) have the task of covering the festivities for a Pittsburgh TV station. In Punxsutawney the Pennsylvania Polka is playing. The weather is extremely cold. And clearly a day in the little town of Punxsutawney is not Phil Connors’ idea of fun. 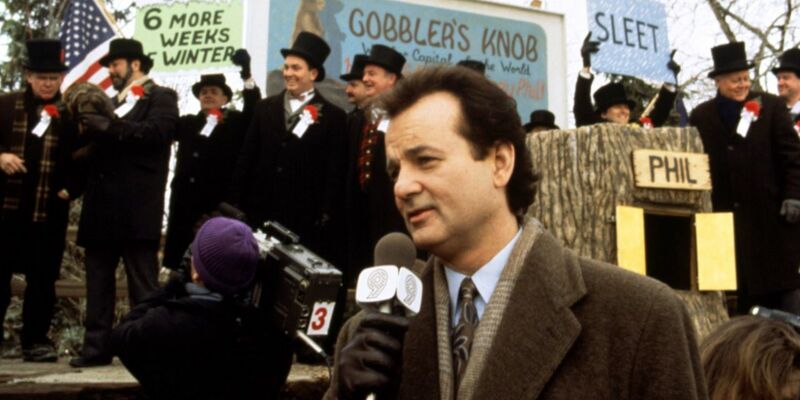 The film Groundhog Day is a popular romantic comedy set in a an attractive small town that is a character in itself (actual location Woodstock, Illinois). But there’s a lot more to Director Harold Ramis’s film than that. I expect you know already, so I’ll risk a spoiler. After all the film is largely responsible for popularising the phrase ‘Groundhog Day’ in the UK. I expect you know already, so I’ll risk a spoiler: Some events in the film “are or appear to be continually repeated”, trapping Phil in a time loop that no one else is aware of. Some viewers interpret the film according to their own philosophies, creeds and religions, with enthusiasts ranging from Buddhists, fundamentalist Christians, and Nietzschean nihilists, to transcendental yogis and Hasidic Jews. The film is called “Black Hole of Love’ In South Korea. Whether you’re looking for purgatory, reincarnation, mitzvahs, or karma, you will probably find what you seek. Other fans may see echoes of Elisabeth Kubler-Ross’s five stages of grief and loss as Phil Connors struggles to come to terms with his situation. And some of us will simply sit back with our popcorn to enjoy an excellent cast, a snowy festival, and a little food for thought. After all, if you could live forever, if your actions seemed to have no consequences, how would you change yourself over time? Would you live your life well? Could you find anything to make this seemingly never-ending daily routine stop? This year Groundhog Day will repeat itself at the Hyde Park Picture House on Saturday February 2nd at 10.30pm.